10th GEM&L International Conference on Management & Language. Crossing language boundaries in organisations / Le défi des frontières linguistiques dans les organisations 16-18 March 2016, ESCP EUROPE, 79, avenue de la République Paris 75011, France. This paper contributes to the body of literature in the field of language in international business (IB) where the academic circles have noticed in the past decade or so, a growing interest of studying language in the context of IB. I have an academic background in general linguistics, so to that extent my interest in language in IB is complementary to most studies of language in IB where language is studied mostly as an object or entity set within the context of organizations. Rather, what interests me is the metafunctions of language – how language is both object / entity of study, but also how metalinguistics can be used as an instrument of studying language in use in organizations. If we look around in our daily lives and happenings, what we find inherent are differing perspectives. These perspectives are pegged at different levels of human organization, from individual level to family, society, nations etc. And this is necessarily so. In an organizational setting, in this time of global mobility and diverse cultures coming together for work purposes whether it is a virtual group meet or a physical group meet, what still remains is the differing perspective. Most of the time, the dynamics is interesting, at times, it is also something that organizations find challenging to manage, especially if it is a cross-cultural, cross-language context. 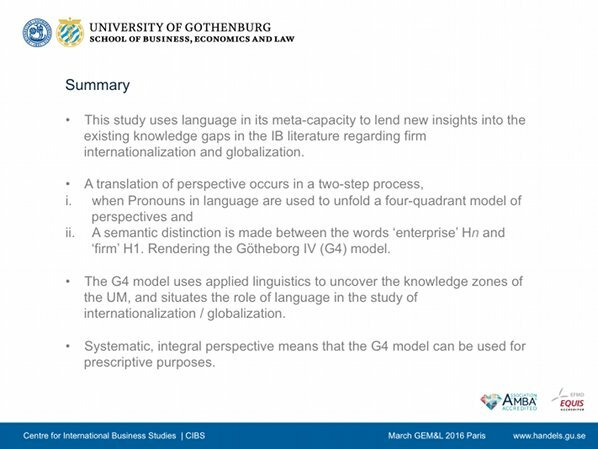 In this study, I’d like to share how metalinguistics can be used to translate these differing perspectives into a model that is set in the context of a firm’s internationalizing / globalizing processes. 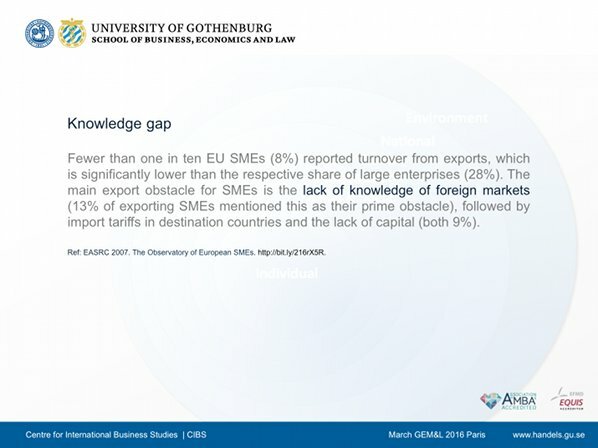 When it comes to the internatioanlizing of the firm or going global, findings of the EU Observatory of European SMEs 2006/7 identified that the gap in knowledge of foreign markets as main obstacle to international expansion of an enterprise. In all aspects, this also encompasses the differences in culture, in languages and in political frameworks that contribute to proper information exchange and transfer of knowledge. Although the EU Observatory surveyed SMEs, the processes within a multinational enterprise can be described as somewhat similar, with regards to their various subsidiaries that can be seen as small enterprises, within the larger MNEs. This can be seen also with regards to new product or service launches within the MNE in new, foreign markets. 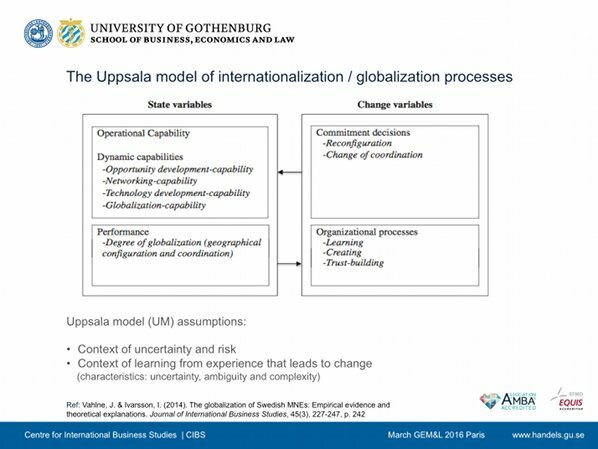 A very widely cited and studied model of a firm’s internationalization and globalization processes is the Uppsala model by Johanson & Vahlne that first appeared in 1977. The authors themselves have reviewed it after having much dialogue about it within the IB academic circles and in 2011 and then in 2014 again, it was put forth as this model here by Vahlne and Ivarsson. The authors themselves believe that the processes of internationalization and globalization are similar in their emergent processes, so the Uppsala model refers to both types of processes. Internationalization encompasses the firm’s increasing involvement in establishing successive operations in new countries, and globalization for the authors mean that the firm can also begin to exploit its network of differentiated units, taking advantage of specialization on location. The Uppsala model is built on two broad assumptions, (i) management of risk in contexts of uncertainty and (ii) learning through experience that causes the organization to evolve through time. So you have three characteristics that underpin the Uppsala model which are – uncertainty, ambiguity and complexity. The Uppsala model is quite explicit in what they study, what type of knowledge zones they fill out in the internationalization / globalization processes. These are filled out in a four quadrant model. Then there are types of knowledges that the authors touch upon but are not explicit or filled out in detail in their study, and those belong mainly to the realm of language, culture and of the learning mechanism in itself in organizational processes. 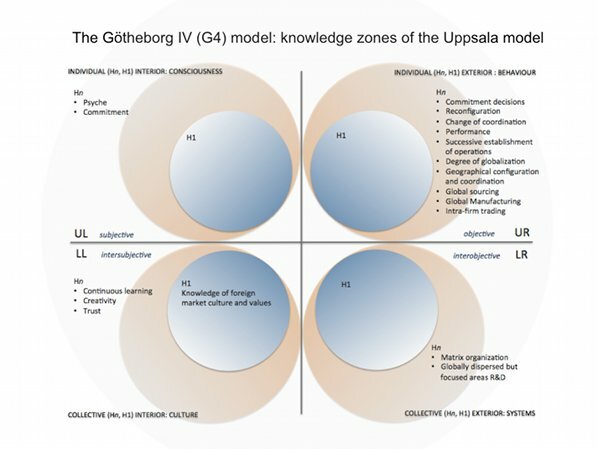 What I’ve done then is to look at the processes outlined in the Uppsala Model is to first distinguish the perspectives – what types of knowledges do they refer to? And you can systematize these perspectives by applying metalinguisitcs, taking for example, the use of pronouns, I, We, It and Its. 75% of the world’s major languages contain a Subject, Object, Verb construct, in differing orders. Pronouns are found in these constructs and are one of the fundamentals in most of the world’s languages. Pronouns function as deictic perspectives, they indicate and determine the different perspectives. 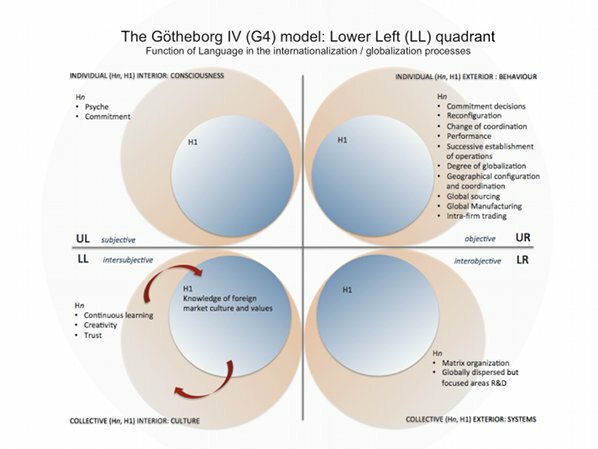 What unfolds is also a four-quadrant model, shown in a later slide that I’ve called the Götheborg IV or G4 model, which can be seen as an applied linguistics perspective of the Uppsala model. The difference in name indicates a difference in perspective. The authors of the Uppsala model studied mainly Swedish MNEs, and it happened that I had also studied Swedish MNEs, in how Swedish top managers worked across cultures. So I studied the subsidiary organization processes, and how Swedish top managers when they went over to a subsidiary in Asia, carried over corporate culture and even national culture into the foreign context. So the data I collected complemented well with the data from the Uppsala model. And the Götheorg IV model is based on the combined data, only however in relation to Swedish MNEs. So the third focus of this study is how metalinguistics can be used to uncover the agency behind how firms take advantage of the local environment for its sustained global development. This was done through looking at the management styles of top Swedish managers in Asian subsidiaries. 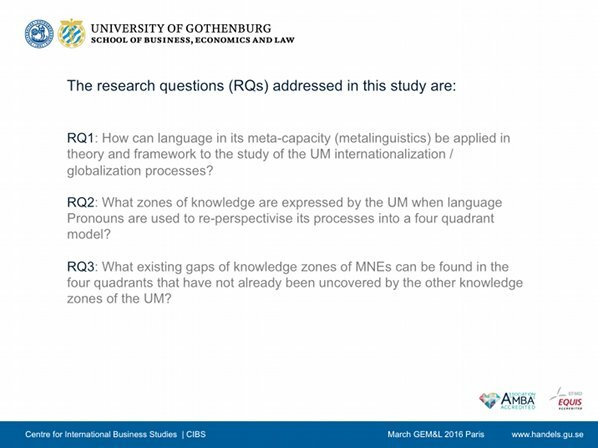 RQ1: How can language in its meta-capacity (metalinguistics) be applied in theory and framework to the study of the UM internationalization / globalization processes? RQ2: What zones of knowledge are expressed by the UM when language Pronouns are used to re-perspectivise its processes into a four quadrant model? RQ3: What existing gaps of knowledge zones of MNEs can be found in the four quadrants that have not already been uncovered by the other knowledge zones of the UM? 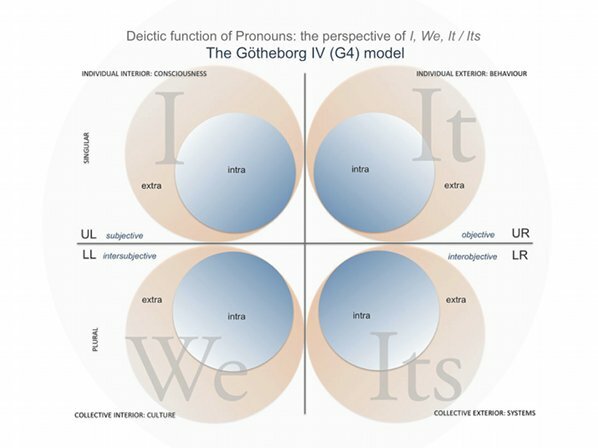 Mapping the deictic function of pronouns, you get a four-quadrant model of the perspective of I, We, It and Its shown as such. The four quadrants – Upper Left, Lower Left, Upper Right and Lower Right – show different levels of perspectives, that whatever is studied within these quadrants, results in a specific type of knowledge. And it is not only that the perspectives cover Individual to Collective, but they cover subjective, intersubjective to objective and interobjective perspectives, from interior Consciousness to exterior Systems. The circles indicate holons in holons, wholes that are part of other wholes. The word ‘holon’ was first introduced by Arthur Koestler in his book The Ghost in the Machines in 1967, and in 1968 at the Alpbach Symposium in a paper called: Beyond Atomism and Holism – the concept of the holon. Today the word is familiar in the context of transformative biology and quantum physics, and in the humanities it is minimally used as a concept to study autopoiesis organizations and hetararchy. You can also visualise how these perspectives that render different types of knowledges are embedded or are part of an even larger network of holons, that form the discourse of internationalization and globalization. 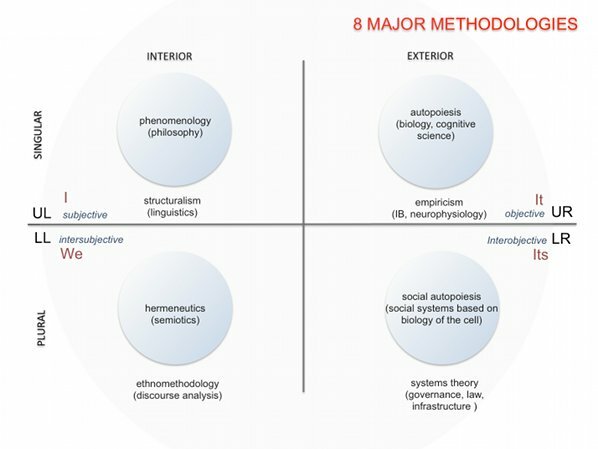 As an example of the types of knowledges acquired with the different perspectives, we’ll all recognize this as the eight major methodologies employed across all academic studies. Some fields have a combination of methodology, and some fields can be described by having one predominant methodology. Most academic fields are empirically oriented in data collection and analysis, IB is one such field. You could place quantum physics in several quadrants, but it is a science that is increasingly applying methods from the Upper Left quadrant, dovetailing with philosophy and phenomenology for example in the study of Consciousness, the structure and workings of the Mind in relation to the study of the structures and workings of the Cosmos. 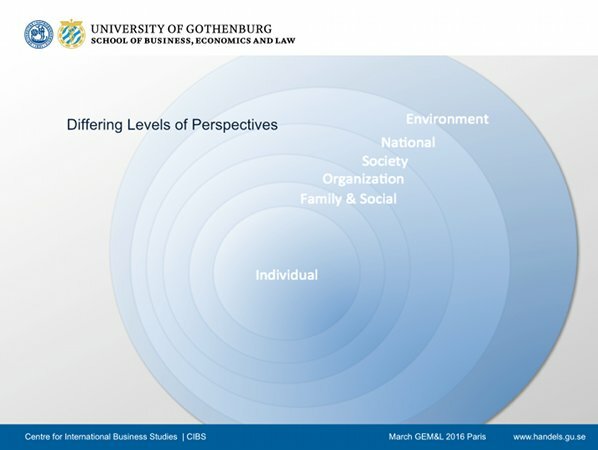 Cultural studies methodology can be found a lot in the Lower Left quadrant, and in fact, when situated in the Götheborg IV model, it is also in the Lower Left quadrant that organizational culture studies, language studies in organizations would be placed. 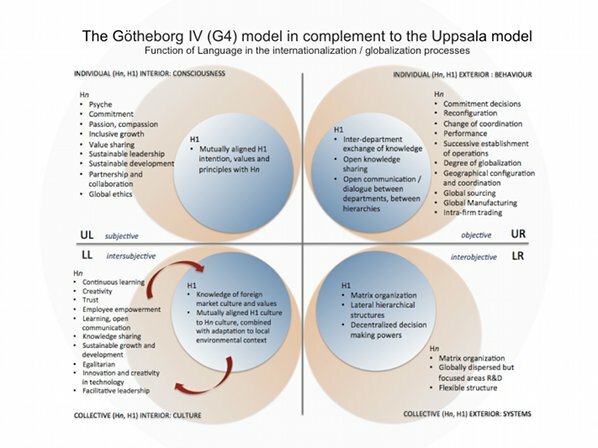 The knowledge zones of the Uppsala internationalization / globalization model, what was seen in Vahlne & Ivarsson’s 2014 version is represented here in G4’s different quadrants. So the first thing I did was to uncover the deictic function of Pronouns that rendered these four quadrant of perspectives. ‘Enterprise’ is denoted by Hn, and the ‘firm’ denoted by H1. The n in the enterprise is only to indicate that an enterprise can contain any number of subsidiary firms. H1 is an example of the subsidiary. Making this distinction gives you eight perspectives from which to study the processes of organization internationalization and globalization, both from the enterprise point of view and from the subsidiary firm point of view – from the enterprise’s psyche and commitment in the Upper Left quadrant, to its knowledge of own culture in alignment with the foreign culture, its learning and creative processes in the Lower Left quadrant, to how these inner values translate to behaviour such as commitment decisions and actions, organization coordination, performance and how it configures itself geographically in the Upper Right quadrant, and to its global network dispersal and its matrix structure, how it as a system function in a web of other systems in the Lower Right quadrant. ‘Time’ is what allows for us to witness the dynamics of the internationalization process, so all of these factors would take place within the fabric of spacetime, and ‘Time’ as such is not singled out as a factor that is in one or another quadrant but it rather is the invisible fabric of all these processes. The dialogic of learning and evolution through Time is shown in the Götheborg IV model as these arrows for process flows between the enterprise and its subdiary firm, and between also the enterprise and its larger business network. The subsidiary firm also is in constant dialogue with its local business network. So all four quadrants would contain these spacetime dialogic flows as the organization evolves through its internationalization and globalization stages. This is the Götheborg IV model with the results of both Vahlne & Ivarsson 2014 combined with my own study on Swedish managers working in foreign subsidiariesin Asia. This model helps visualize where the knowledge gaps are and where to focus further research efforts. In this instance, the left side of the quadrant gets distinctly more filled in, resulting in a deeper, more comprehensive perspective and understanding of the internationalization and globalization processes. And this is achieved by applying metalinguistics to the study of organization internationalization and globalization processes. 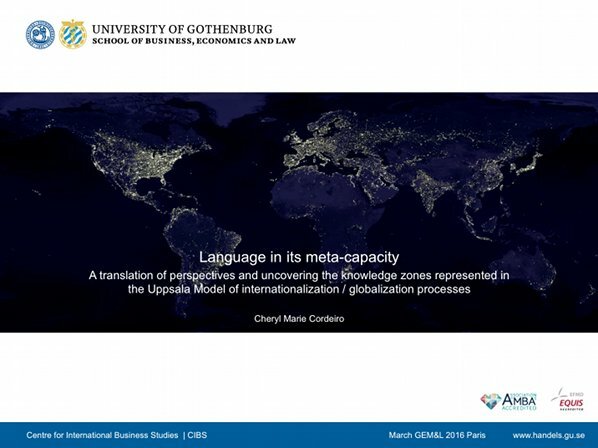 In brief summary, this study is in contribution to the language in IB literature, by looking at the metafunctions of linguistics applied to the internationalization / globalization processes of a firm. Two things were done, the first is to unfold the perspectives of Pronouns. And the second is to make explicit the distinction between ‘enterprise’ and ‘firm’ which was implicit in the Uppsala Model. By doing this, the various knowledge zones can be mapped, and then findings from the two different studies on Swedish MNEs could be combined and mapped into the Götheborg IV model. You can in this process, also identify research gaps and future avenues of research. 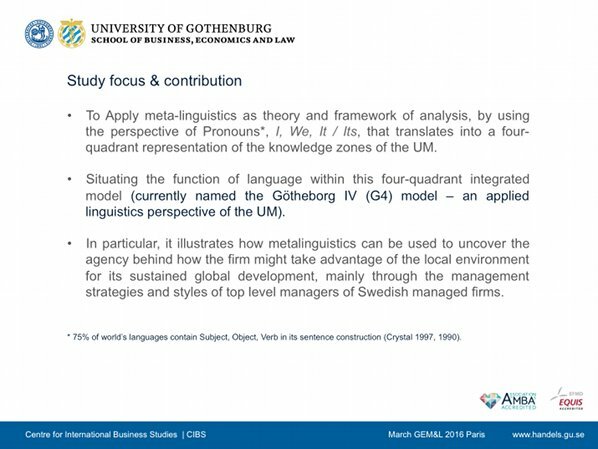 Because the Götheborg IV model is linguistically fundamental, founded in the deictic function of the use of Pronouns, and because it is systematic at the same time able to capture certain fluid aspects of complexity, the G4 model, like the Uppsala model, can be used for prescriptive purposes. Thank you for listening and if there are any questions, I’d be happy to address them. 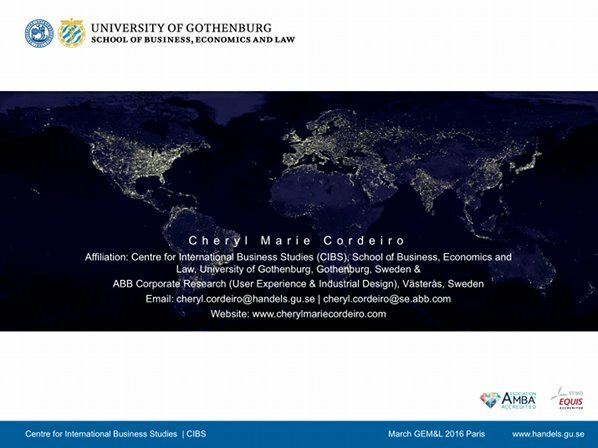 Cheryl Marie Cordeiro is Research Fellow at the Centre for International Business Studies (CIBS), School of Business, Economics and Law at the University of Gothenburg. She is currently a Flexit scholar of the Bank of Sweden Tercentenary Foundation, Riksbankens Jubileumsfond (RJ), doing her post-doctoral degree at ABB Corporate Research with the User Experience & Industrial Design group in Västerås, Sweden. She has a Master of Science in Information Studies from the Nanyang Technological University (NTU) of Singapore, and a Master of Arts in the English Language from the National University of Singapore (NUS). She has a doctoral degree in general linguistics from the University of Gothenburg. She is former Miss Universe Singapore 1999. She Her CV can be found on her webpage at www.cherylmariecordeiro.com.